Recently I realised that I really don't have many wips going at the moment, since I got quite good at finishing things. In fact, I only had one things yesterday that was a true wip and I badly needed a break from it - oh horror! So I decided to cast on something new and exciting - I had this gorgeous yarn, variegated, which caused me great trouble because I never know what to do with it....To find a pattern that is simple enough to carry off many colours at once but interesting at the same time is a tricky thing. So when one of my fav designers Army of Knitters published Spey skirt, I knew which yarn to use for it! Because I'm using two strands of heavy dk, it knits up so quick which is a welcome change from the wip below! I picked strands from two ends, one from beginning, one from end/middle of the skein and it's very addictive to watch how colours play together, sometimes there are long runs of the same colour in both strands! I'm using Eastern style knitting for ribbing to make sure my purls are not stretching out my knits, it seems to be a very popular knitting method since Ysolda's book come out and I have to say I'm very relieved because it's the way that purl stitch has always been the quickest and easiest for me to do! Wow, that first yarn is lovely, I'd love to know what it is. I hate when rows take so long, which is why I haven't cast on another shawl, it just gets so tedious, doesn't it?! I have opened another tab to check out that skirt. I'm into skirts at the moment. I also really would like to make a shawl, but have to find one that I am 100% sure I will make. So will check this one out as well. I love it when the colour of the yarn makes you want to knit more to see what's going to happen next. It's addictive. That's a cute skirt! I'm going to be making one of Heather Dixon's skirts soon, too. Let me know if you like how the pattern is written! The variegated yarn is knitting up in a lovely way. You've got great taste in colours. I love the top yarn especially. The shawl looks fab, I can't wait to see it finished. Oooh, that skirt looks like it's going to be gorgeous! I love Army of Knitters! The yarn for your skirt is beautiful! Ruffles tend to be very slow but your shawl will be beautiful. Your Sway is going to be gorgeous and I love the color of the shawl!! Gorgeous the way the two colours are working up together! That's amazing, to run out of WIPs! Good for you. I'm interested in watching your skirt progress. That shawl is very lovely. Boo for long rows. Yeah! for new projects! It's the first time I saw that Spey skirt pattern. It'll be great to see how yours turns out. 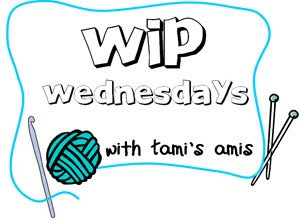 I always think my WIP project appreciates it when I abandon it to start something new ... gives us both a break! I love love the red project! Never heard of eastern style knitting, I shall research that. Love the yarn for this skirt. very pretty! i know what you mean about variegated yarns -- sometimes the ones that appeal to me the most in the store are the most difficult to match to a pattern. That skirt is going to be a stunner, I really love the way the yarn is working up.